Whether you are the parent of a baby or a teenager, we can all agree that parenting is a challenge! It can be wonderful one day and then exhausting, stressful and overwhelming the next. We can adjust our thoughts and feelings about the struggles of parenting and become calmer and more positive parents. In making a few small changes, we'll actually enjoy our children more, and better yet- our child(ren)'s behaviors will follow our lead. Here are a few small changes that will produce a stronger and more positive relationship between you and your child(ren). Think of something your child does that drives you crazy or upsets you. Does your toddler's high pitch shriek get under your skin? Does your baby throwing food make you want to yell? First, think about what your child is getting out of this behavior you consider "bad." Is it your attention? Or is it a reaction? A negative reaction from a parent is good enough for a kid who is trying to get any attention. Your angry reaction is only keeping the behavior going. Secondly, think about why the behavior is bothering you so much. Are you embarrassed in front of others? Have you decided it is a "bad" behavior because it is something adults do not deem acceptable? Most of these behaviors may be annoying, but they are developmentally appropriate and not hurting your child or anyone else. The less you stress about them, the sooner they will come to an end. Sometimes we forget that our kids are just kids! Having expectations that are not age-appropriate for your children will only set them up for failure and give them reasons to disappoint you. Do you expect your child to have proper table manners, to sit for long meals or greet all your friends and relatives? Teaching your children these "adult" behaviors and modeling them will encourage your children to do them, but keep your expectations in check, especially if your child has not napped or is hungry. The holiday season is a time when these unwanted behaviors come out because kids get overwhelmed by big gatherings or eating and sleeping at different times. Some kids are more introverted or shy and feel uncomfortable talking to adults. If you lower your expectations, there is less room for frustration. Can you remember the horrendous first weeks home with a newborn? You were not sleeping, feeding a tiny being every 2 hours. For most parents, that stage felt like it would never end, but it did, and so will each phase. If your 12 hours a night solid sleeper just started waking up at 3am or your veggie-loving kid will only eat Mac and cheese, remind yourself that most undesirable behaviors are phases - with endings. If your child's behaviors continue for a while, talk to your pediatrician. Do you ask your partner to change the babies diaper, drop off your son at soccer or help your daughter get on her shoes? Of course! But do you share your emotional responsibilities as a parent? Asking for tangible or physical help is easier for parents. If you are feeling worried about how your kid is in School or simply feeling overwhelmed by all the feelings that come with being a parent, share those with your partner. You don't need to carry the weight of the world on your shoulders. 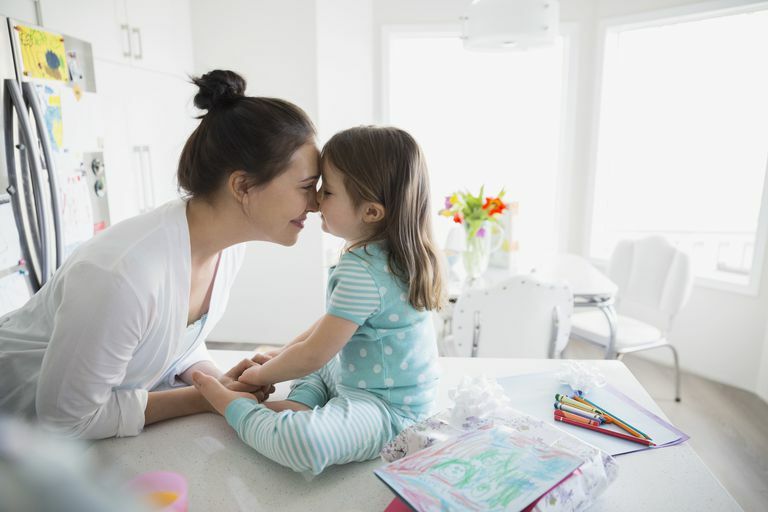 Connecting with your child will make your job as a parent easier because children who feel connected listen better, feel less frustrated and choose positive behaviors. If your child exhibiting bad behavior, first try and connect with your child before addressing the bad behavior. The behavior may be a manifesting of a need for attention, feelings of abandonment or isolation or other yucky feelings. It is also important to connect with your child on a daily basis, outside of discipline. Children who feel connected to their parents have higher self-esteem, are more confident and make better decisions. Spend at least 15-30 minutes a day engaging with your child, with no other distractions. Let your child choose a game or activity or do a creative project together like the "Connected Hearts Journal," a keepsake journal for kids. Engaging in meaningful activities with your child(red) is a wonderful way to get to know them better, build their self-esteem and character, share values, strengthen emotional intelligence and create special memories. The next part of connecting to change bad behavior involves coaching your child and not controlling your child through helicopter or authoritative parenting. Think of yourself as your child's life coach - someone who will encourage them to make good decisions and modeling appropriate behaviors. If you control your child, how will they ever learn to make decisions for themselves? Many times parents dismiss kids feelings because they view them as immature or over dramatic. When your child is upset, take a step back, don't judge and view the situation through your child's eyes. Doing so will make it easier to be empathetic and validate your child's feelings. This will bring your closer and will let your child know it is safe to tell you his or her sad feelings. Did you want an athlete and you got a brain? Throw away all your ideas of what your child would be like before they were born and really take a good look at the child you have in the present moment. This is especially important for parents of multiple children. Each child is different, with different qualities, flaws, and personalities and should be parented in a way that suits their needs. There is no one size fits all in parenting and once you parent the child you have, your job as a parent will feel much easier.